Who doesn’t love going on a campervan adventure with their kids? There is no better way for a family to bond – fact! But sometimes planning and packing for a family holiday is hard, especially when you’re in a campervan or camping and need to have the right items for all activities. Being well organised and prepared in advance is the key to making sure your family campervan trip goes smoothly. We’ve created a detailed packing list, designed especially for families, so you don’t forget any of those essential items when you’re off the grid! When it comes to packing clothing, it helps to try and pack light. However, don’t go too minimalistic. As you know, kids get dirty quickly and you don’t want to be doing laundry daily. Opt for quick drying and sweat-wicking fabrics designed for travelling. If there’s one thing you can guarantee about New Zealand, it’s the unpredictable weather! In fact sometimes we’re known to have “four seasons in one day” so it’s best to be prepared, even if you’re travelling in summer. Layers will soon become your best friend in New Zealand! Of course, this won’t stop your three-year-old from insisting on wearing nothing but a bathing costume and tutu with wellies, but you should at least have some layers ready for a more sensible clothing option! Waterproof jacket – to make sure you can explore even on the gloomiest of days and spend as much time outside as possible. You need to be comfy while sleeping in your campervan so don’t hold back on packing all of your favourite pillows along with your sleeping bags. If you and the kids are well rested, it means everyone will be happier and a lot less stress for you. Travellers Autobarn can provide you with extra sleeping bags as well, so even if you forget them we’ll have the backup. We also provide free heaters and water bottles in the winter, as well as a number of other optional campervan equipment. Nightlights or torches – apart from the obvious uses, it can be difficult to get kids to sleep when the lights are on inside your van. Instead, turn the lights off at bedtime and use a torch if you need something from inside. Mum and dad can then relax outside with a camping lamp and a glass of wine or two. When you’re travelling with kids it’s always important to bring lots of snacks, as those dips in blood sugar can lead to crankiness and frayed tempers. Not what you want when on a long journey. Dried and tinned food in particular for when you can’t buy fresh or don’t want to go out to eat – dried noodles and pasta, rice, tinned vegetables, beans, and soup, jams, honey & peanut butter, dried fruit snacks, cereal bars, spices, long life milk, and oil. Don’t forget the marshmallows for toasting on the open fire! Microwavable containers – if you have the option of hiring a campervan with a microwave, this can be a lifesaver when you’re travelling with kids. When witching hour hits and everyone’s tired and hungry, quick and easy food can be prepped in minutes. Water filter or water purification tablets – in case you don’t have immediate access to clean drinking water. For kitchen equipment we do have you covered though, as we offer pots, pans, plates, cutlery – the whole lot. Have you got your first aid kit to fulfil your role as super-mum/dad? Hopefully, the answer is yes! Whatever you do, make sure your kit is packed for all disasters – kids can have the strangest incidents, making you either laugh or cry! For smaller children, it helps to be creative when it comes to treating the inevitable cuts and scrapes. Wrapping your kids up in cotton wool isn’t something you want to do when you’re exploring the wilderness but some toddlers can become hysterical at even the tiniest spot of blood. In these cases, your box of tricks (first aid kit) becomes your best friend with its “magic” antiseptic cream, cartoon-adorned Band-Aids, and, of course, a lolly or two won’t hurt either! Some campervan sites have pretty luxurious shower facilities, while at others you’ll be lucky if you get a cold tap and a bar of soap. Even in the most remote surroundings, having a selection of your own toiletries and wash products can bring a little taste of your home comforts. Fill up small bottles and give each member of the family their own wash bag so there’s no need to take it in turns to have showers. Antibacterial wet wipes – as well as the obvious uses, wet wipes can be invaluable when you’re travelling between campsites and don’t have the chance to shower for a few days. Keep you and the kids fresh while you’re on a long journey. Baby bath or big bucket – even older kids will love the novelty of a bucket bath! Also if you’re staying at a more basic campervan site and only have access to cold showers, you can make bath time a bit more tolerable for the little ones by heating up some water for an al fresco bathing experience! There will be plenty to see and do while you’re on your trip but sometimes kids just need a bit of downtime at camp or something to keep them occupied while you’re driving to your next destination. Headphones – make sure each kid has their own pair! Toys – bring a couple of favourites from home and some new options to pull out on a rainy day. However, you’ll find your kids are generally happy to play with sticks and stones and whatever they find around them. You’ll be spending the majority of your time outdoors, which is both a blessing and a curse. Kids need less entertainment and are better at keeping themselves occupied in the great outdoors but they also seem to be a magnet for insects, dog poo, toddler-sized holes, and pretty much any other mischief they can find themselves in. It’s best to be prepared but go with the flow and remember you can always hose your kids down at the end of the day! And last but by no means least – all those random bits and pieces that are so important but you’re so likely to forget! There’s a whole host of travel gadgets available. Honestly, it can be tempting to get carried away when you’re shopping in your local store, but stick to the essentials and opt for multi-use items where possible. Chargers for electronics – it’s well worth investing in a couple of solar chargers for when you’re on the road and don’t have the chance to power up for a few days. If you keep them on the dashboard while you’re driving, you should have enough power by the evening to charge up your phones. Clothesline and pegs – you can get a special travel clothesline with suction cups and attached pegs so they don’t get lost. That’s it – you’re now packed and ready to hit the open road in your campervan! If you’re looking to go on an adventure with your family and think that hiring a campervan would be a great option, come and chat with our friendly staff today. We are experts in family travel and know all the tips and tricks you need to make sure your camping trip is great fun and stress-free. New Zealand has a varied selection of basic but beautiful campgrounds to holiday parks with all the mod cons and a wide range of facilities. 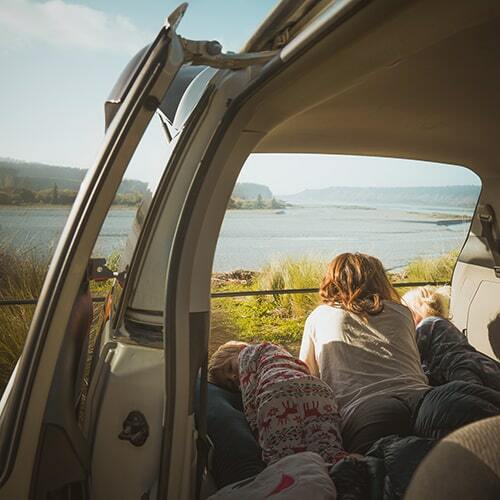 If you’re planning a family adventure in New Zealand then here’s a rundown of the best spots to park up and camp with your kids. Tranquility, sun, surf and sand are the name of the game here. This family friendly camping ground has 80 powered and 40 unpowered large, flat pitches. There’s a children’s adventure playground that boasts the longest slide in the far north as well as a regular children’s activity program to keep them busy! Other facilities include an onsite bakery with excellent pies and barista coffee, TV rooms, al fresco dining, bbqs and an onsite shop. There’s also the option to get a takeaway onsite as well if you feel like taking a break from cooking! Hire a campervan in Auckland and make the short two hour drive north to this perfect kid-friendly spot! This family focused holiday park, set in the picturesque coastal town of Paekakariki, is the perfect place to relax and have fun with the family. This holiday park also caters for kids who have lots of energy to burn, with a jumping pillow, playground and trampolines onsite. If you feel like venturing out it’s conveniently located close to the beach, train station and the local shops. Address: 180 Wellington Road, Queen Elizabeth Park, Paekakariki, 5034. The Bay of Islands Holiday Park is jam packed full of facilities that will help to make your stay easy and fun. There’s safe river swimming and kayak hire, a swimming pool, flying fox, trampoline, swings, slide and other activities in the playground. Plus volleyball courts and a large recreation room in case you do get a couple of days of bad weather. For the adults there wifi access onsite, bbqs, wood fired pizza ovens and a convenience store onsite. Perfect! If you want to get out and about the campsite is well located for exploring the beautiful Bay of Islands. It’s centrally located 10 minutes drive from both Paihia and Kerikeri so you can enjoy the best of both worlds. This well established holiday park is perfectly situated nearby to downtown Christchurch. This means days out with the kids exploring the city couldn’t be easier – in fact the public bus can pick you up and drop you off from right outside the park’s front gate. This holiday park is set on sheltered and landscaped grounds and offers a wide range of facilities that include; free wifi, bbqs, family shower rooms, and a children’s play area. They also offer high chairs and port-a-cots for hire. This lovely campsite offers 36 unpowered camping sites for tenting, campervans or caravans. It’s also home to full shower and toilet facilities, BBQs, gas cooking and dishwashing facilities; shared refrigerators and microwaves; a children’s playground; bocce ball; and a coin-operated laundry. The onsite general store makes it easy to pick up supplies and there are also bikes available to rent from reception. There is lots to do nearby during your stay in Glenorchy; hiking, kayaking, horseback riding, helicopter tours, photography tours, 4-wheel drive tours and jet-boating. The onsite booking service can help you arrange anything you and the kids want to do! This back-to-basics adventure camp is dedicated to providing you and the kids the best camping trip ever. Set on a beautiful 10 hectares of land with native trees this camp offers safe river swimming, go-karts, water slides and flying foxes. There’s also a skatepark and BMX tracks for the older kids. There’s a large communal kitchen with cooktops, an oven and microwave to make feeding the family easy, as well as bbqs, campfires, internet access and a shop for all your basic camping supplies. Travellers Autobarn have campervans for hire in New Zealand, pick up available from Auckland and Christchurch. If you’re looking to hire a campervan in New Zealand for your upcoming family adventure then get in touch with the team or request a quote today. New Zealand brings in tourists all year round and that means booking a hotel room for the family can get expensive. Camping is a cost effective and flexible alternative that gives you the opportunity to truly experience the beauty of New Zealand’s great outdoors. Fiordland National Park is a World Heritage site that’s home to world famous hiking tracks, deep fiords, sparkling lakes, rainforests and wild rivers. It’s also host to some great family friendly camping spots, making this the perfect destination for a family camping holiday in New Zealand. 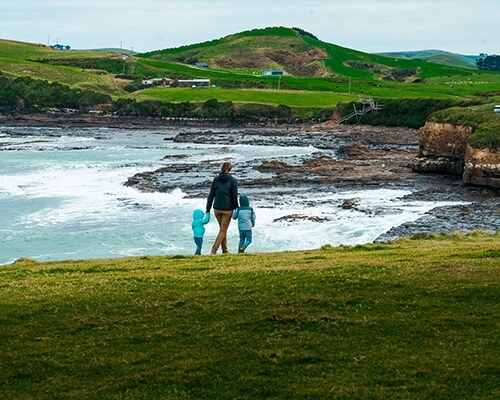 Whether you’re hiring a campervan in New Zealand or just plan on pitching up a tent, here’s a rundown of the best family friendly campsites in the area. This family run holiday park is situated on the south shore of Lake Ta Anau and gives you the opportunity to relax while enjoying unforgettable views across the stunning Lake Te Anau and into the Fiordland mountain range. It’s situated an easy 2 hour driving distance away from Milford or Doubtful Sounds, Queenstown and Invercargill and a ten minutes walk from the Te Anau town centre. Facilities include: children’s play area, BBQs, picnic tables, Sky TV lounge, IAC & wireless internet, laundries, sauna/spa bath, communal bathrooms & kitchens. This family friendly holiday park is ideally located a one minute walk away from the local town, where you can find shops, cafes and restaurants. At the campsite you’ll find an Adventure playground for the kids, a BBQ area, wireless internet and large warm communal areas including lounge with log fire. There’s also an onsite free trip booking service to help you get organised with your activities and tours. Visit the website for more info here. This holiday park is perfectly positioned if you plan on visiting all the major attractions in the Fiordland National Park. This kiwi holiday park is a traditional camping ground located on the Edge of Lake Manapouri. It’s also in walking distance of the Doubtful Sound departures jetty. The camp kitchen, lounge, showers, laundry and toilets facilities are available to all guests. This camping ground, managed by the Department of Conservation, is located in the middle of the Fiordland National Park. It has basic facilities basic facilities such as toilets, barbecue and picnic tables, making this an ideal spot to park up your hired campervan or caravan. Relax against the backdrop of the mountains and fiords or take advantage of this camp’s location and enjoy family activities such as fishing or walking. Located at the entrance of the Fiordland region, the Queenstown Lake View Holiday Park is a great place to park up the car or campervan and chill out after an activity filled day with the kids. This campground has more an 100 sites with or without electricity. It also has all the facilities you need to keep the family happy such as a wide and spacious modern camp kitchen, showers and toilets, barbecue grills, laundry facilities, a TV room and a playground for children, internet access and a dump station. If you’re looking to hire a campervan in New Zealand for your upcoming trip then get in touch with the team or request a quote today. Travelling with your kids can be a wonderful experience for the whole family, especially if you are camping. You will have the time to bond with your family and give your kids experiences that they will remember for their whole lives. If you are going to be travelling with children, however, there are a few things you should know to help you have a fun and safe trip. Here are some things to keep in mind when planning your family campervan trip. It is well worth taking plenty of time to research and plan your trip. You will want to plan your route with things like rest stops and destinations in mind. 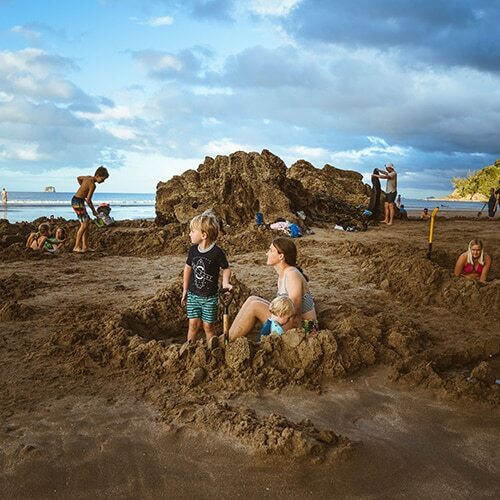 If you are travelling by campervan, you will want to make sure to find family-friendly campgrounds with activities such as swimming or hiking that you can do with the family in the event that you get in too late to go site seeing but too early to go to bed. Safety is always important, but never so much as when you are travelling with your children. Make sure that you are following all laws for child restraints in the area where you will be travelling. Small children should be restrained in approved booster seats or half-booster cushions. Older children should be in approved restraints. And, no child under the age of 12 should be sitting in the front seat. Children are in constant need of stimulation– unless they are napping. Make sure to pack plenty of activities they can do while you are travelling. Crayons are a great way to entertain children. An electronic device such as a tablet can also be useful for games. With an individual set of headphones, they can play games, listen to music, or watch videos. If you want to cut down on screen time you can also play games together such as 20 questions or license plate alphabet. Keep in mind that a campervan is not well insulated for sound. As any parent knows, children like to be active and they tend to make plenty of noise. If you have a choice, try to find other families to park beside. Another family with children will likely be more tolerant of noise than an elderly couple, for example, because they will be making plenty of noise themselves. If you have neighbours who are less likely to be tolerant of noise, you might try taking the children away from the campsite for swimming or hiking or some other activity. Getting them to use up some of that energy before settling in for the night could get them calmer and quieter. You might also talk to them before starting out on the trip about how to be a good neighbour. If you are travelling in a campervan, you will have no privacy. This is a fact that you will simply have to live with. As parents, you can still have time alone with your spouse when the children are sleeping. You might sit simply sit outside the camper, enjoying the stars and one another’s company as you sip a glass of wine. So, where will you go? There are so many wonderful places in New Zealand to take a family trip. Here are a few. • Rotorua – Geysers, hot springs and bubbling mud all make this city a popular attraction for anyone interested in experiencing the geothermal wonders of the earth and learning about the Maori culture, as well. • Otorohanga Kiwi House and Native Bird Park- The kiwi bird is one of the most important birds in New Zealand culture. It is also endangered. Come to hear keeper talks, feed the birds and meet many other species native to New Zealand. • Akaroa Harbour – You can swim with the dolphins. There are several varieties of dolphin living here, including the elusive Hector dolphin. Akaroa Harbor is one of the only places in the world where you can meet the Hector dolphin. Tour operators take great care to ensure the dolphins are protected and your tour fee helps with conservation costs. • Hobbiton – This is where the Lord of the Rings Movies were filmed. Come and visit a real Hobbit village. Join a tour group or explore on your own. • The Beach – There are so many stunning beaches in New Zealand, it would be impossible to list only one here. All you need is a swimsuit and a picnic lunch to enjoy one of New Zealand’s most popular attractions. There are many adventures awaiting you and your family in New Zealand. One of the best ways to see and experience New Zealand is by renting a campervan and driving. You can do and see whatever you like at your own pace. You will also be creating memories that you and your children will cherish for a lifetime. If you are looking for the campervan to take you there, visit Travellers Autobarn. New Zealand has a wide selection of camping grounds, from basic but beautiful campgrounds, to holiday parks with all the mod cons and a wide range of facilities. If you’re planning a family adventure in New Zealand then here’s a rundown of the best spots to park up and camp with your kids. Exploring New Zealand as a family will provide long-lasting memories which you will look back at for many many years to come. No matter how old your kids are – or all adults – roadtrips always bring the family together (well a few arguments might happen on the way lol). Feel free to read some of our tips for travelling with your family – no matter of age – through New Zealand. Best camp spots, best spots to visit with your family, what to consider when travelling with kids around New Zealand and much much more….